Is Copper Pipe Corrosion Causing my Plumbing Pipes to Change Color? If you’ve noticed your copper pipes changing color, it could indicate that your pipes are corroding and reaching the end of their useful lives. 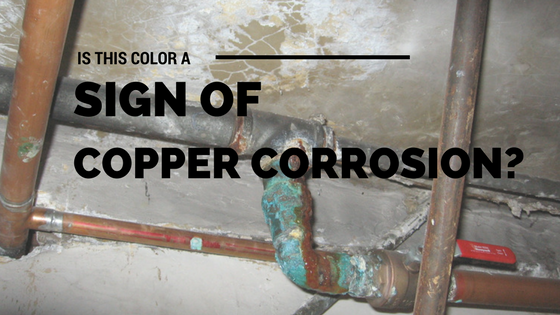 Signs of copper pipe corrosion often include a change in color of the pipes and/or a change in watercolor. If these signs are followed by a noticeable drop in water pressure, you may already have leaks. Why do copper pipes change color? Copper pipes can change color for a variety of reasons, and almost all of those reasons indicate some type of pipe corrosion or oxidation of the metal. The most common copper color changes are blue, green and black. Blue or Bluish-Green – Blue or bluish green coloring can indicate corrosion. If the water appears blue or bluish-green when it comes out of the taps, the corrosion is likely inside the water pipe. If you notice the exterior of the pipe turning colors, you have a pinhole leak. Green – Green or greenish colors on the outside of your copper water pipes means that you have water leaks in your copper piping and possible corrosion. The latter is especially true if the water itself is staining other items, like clothing, sinks, and fixtures. Black – If you see black copper, it may indicate the presence of high sulfur levels or other chemicals in the air, like sewer gas. It could also indicate that the pipe is coming into contact with other non-compatible metals, especially galvanized steel. The worst-case scenario for black copper water pipes is that the builder installed extremely cheap copper that contains a high amount of impurities. Over time, those impurities manifest themselves on the surface of the pipe. Does all copper pipe corrosion lead to pipe failure? When we talk about copper corrosion, we are talking about factors that are distressing and/or eating away at the metal. As areas of the pipe wall become thinner, it can lead to pinhole leaks, cracks and burst pipes. If the pipes are not repaired or restored, over time, the corrosion can lead to complete pipe failure and the need to have emergency plumbing maintenance performed. What can I do if I suspect my copper water lines are experiencing corrosion? If you believe that your copper water pipes are experiencing corrosion, you should call a certified plumber and have a plumbing pipe inspection performed. Here at NuFlow, we call these inspections Building Pipe Assessments, and they include a camera inspection of your plumbing pipes. You can ask that all your plumbing pipes be inspected, or you can indicate which pipes you’d like inspected. 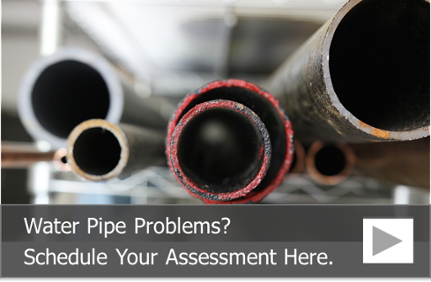 Each of our Building Pipe Inspections includes a thorough camera inspection and video footage of the insides of your pipes, a detailed report on what was found, whether or not we can line your pipes with epoxy and an estimate for pipe lining. How can NuFlow help me stop pipe corrosion? Nuflow’s custom pipe lining solutions can help stop your plumbing pipe corrosion in Chicago. Depending on the diameter of the pipe, we may recommend an epoxy coating or a pipe liner. Prior to the installation, your pipes are completely cleaned in order to remove corrosion and debris from the inside of your plumbing pipes and restore the internal diameter. The pipe coating or liner is then inserted into the pipe and left to cure. Once the coating or liner has cured, it completely prevents water from coming into contact with the metal of the pipe. This helps extend the useful life of your plumbing pipes and prevents further corrosion. To learn more about the pipe lining process and how we can help you prevent copper pipe corrosion, call us at 815-790-9000.